I have many friends who are great cooks, and Matt is one of them–in fact, I fully expect him to go to culinary school one day and become a professional chef! Everything he makes is really good. 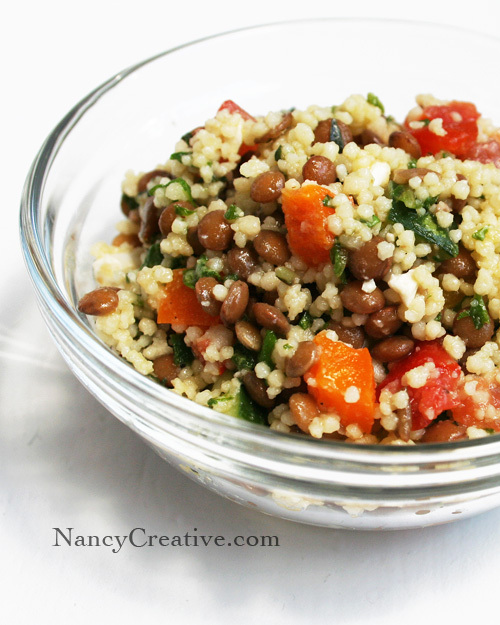 Like me, he loves baking sweets and rich desserts, but also likes making healthy dishes…like this Couscous and Lentil Salad. He brought it in to work for a special lunch gathering one day and I had the chance to taste some of it. I loved it! Not only does it taste great, it’s also made with lots of healthy ingredients…lentils, olive oil, garlic, cherry tomatoes, cucumber, feta cheese…what’s not to like about this? 🙂 I asked Matt if I could have his recipe so I could share it with you. It’s a great side dish for lunch or dinner. It’s actually a good meal in itself if you’re wanting something light and healthy. So thanks to Matt, you can try this too! Let me know how you like it! optional: can also add sweet peppers and/or kalamata olives, and use with any combination of the vegetables above. Also works well without the cheese. Cover lentils with water by a couple of inches and simmer approximately 15 minutes, tasting periodically — they should be just tender and not mushy. Drain well and transfer to a bowl, and stir in one tablespoon vinegar. Add salt and pepper to taste. Cool completely, stirring occasionally. Prepare couscous according to package directions using water or chicken stock and the 3/4 teaspoon salt. Fluff couscous after standing for 5 minutes and transfer immediately to a large bowl. Stir in 1 tablespoon oil. Cool completely, stirring occasionally. Whisk together garlic paste (made with the 2 mashed garlic cloves and salt) and remaining vinegar and oil to make a dressing; add salt and pepper to taste. 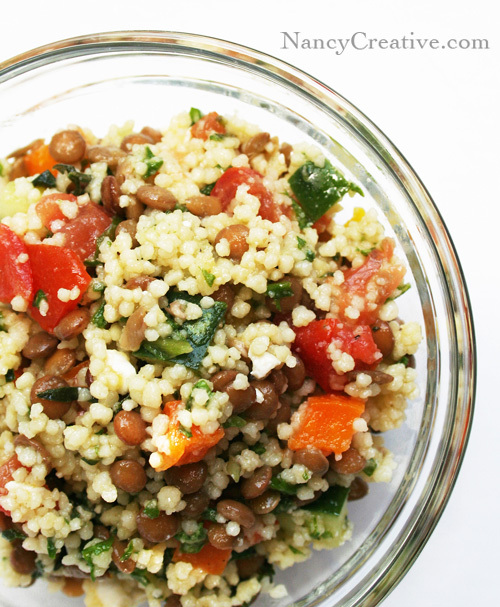 Combine lentils and garlic dressing mixture with couscous and stir well. Cover and chill in refrigerator. Before serving, stir in remaining ingredients and season to taste. Add more oil and vinegar if necessary. Matt said this recipe makes 6 to 8 side servings. This entry was posted in Food and Recipes, Guest Chef, Healthy Eating, Salads and Dressings, Side Dishes and tagged Couscous, cucumber, Everyday, feta cheese, Lentil, olive oil, side dishes, tomatoes on April 15, 2011 by nancyc. What a healthy and delicious salad this is!